“He’s something of a superstar executive,” says McDonnell-Douglas’s CEO Sanford McDonnell. “He’s personable, good looking and has a lot of drive and perseverance.” “He’s the classic example of the intense, hard-driving executive who demands performance and grinds it out,” says Don Brandin, CEO of Boatman’s Bancshares. “He’s got an astounding ability to get things done,” echoes Interco’s Harvey Saligman. “Dynamic guy,” quips Union Electric boss William Cornelius. “He exercises a high degree of personal control and gets good results because he wills it,” observes Sara Lee Corporation’s John Bryan. Who is the object of this admiration? Lee Iacocca? Jack Welch? Walter Wriston during his heyday at Citicorp? No, it’s Charles F. Knight, 51, chairman and chief executive of Emerson Electric, a $5 billion St. Louis-based manufacturer of electrical and electronic products. Twice nominated by Chief Executive readers as a finalist, “Chuck” Knight emerged the unanimous choice of this year’s panel of judges to be the 1987 Chief Executive of the Year. The reason, as summed up by GM’s Roger Smith, a panel member and last year’s award recipient, “in this era Knight’s performance is amazing.” Without much fanfare Emerson has racked up 29 consecutive years of increased earnings per share (from 1956 to 1986 the growth rate averaged 12.1 percent), and 30 consecutive years of increased dividends per share – and this with an average return of stockholder’s equity (17.1 to 20 percent over the last 10 years) well above Standard and Poor’s 400. But profits alone didn’t assure Knight his laurels. “Consider the kinds of tough, unglamorous businesses he’s operating,” observes Robert W. Lear, a veteran judge. “Even good managers would have had to endure downswings due to the economy of foreign competition.” “I’ve never met the guy,” says another veteran judge, Patrick J. Foley, chairman and CEO of Hyatt Hotels, “but I couldn’t help being impressed by such a sustained record of performance.” In other words, the judges turned not to a household name, but to a professionals’ professional. Knight himself ascribes his success at Emerson to the “management process,” a system of continuous, some might say relentless, planning, communication and control. Tall, with Frank Merriwell good looks, the former Cornell University football tight end is intense even when he’s personable and socially charming. This drivenness has been a hallmark of Knight’s business career. Two years after he earned his MBA at Cornell – in 1961 – he joined his father’s engineering consulting firm, Lester B. Knight & Associates in Chicago. His father trained him hard and hoped ultimately that his son would take over the firm. Several years later, Knight and a number of key executives did just that. With 80 percent control, young Knight was on his way to expanding the practice. One of its clients was Emerson Electric (no relation to Emerson Radio), an old-line manufacturer of motors, components and a defense contractor. Emerson was led at the time by Wallace R. “Buck” Persons, who liked Knight’s organizational insights. By 1968, Knight was sitting on several Emerson company boards – including the motor division – and participating in its first international planning conference. Person’s interest and confidence in Knight had a great effect on the young executive. “It’s been one of the great relationships in my life.” Knight recalls. By 1972, at age 36, he joined Emerson, leaving the presidency of Lester B. Knight and a disappointed father who had hopes of his son’s running the firm. Within a year Knight became vice chairman and chief executive, making him the youngest CEO of any billion-dollar corporation. 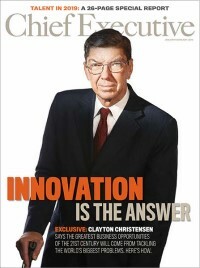 Over the following 10 years, Knight devoted himself to building the organizational process without which, he says, “this place would be just an average company.” The core of his approach is a planning and implementation system that stresses above-average growth, return on equity of 18 to 20 percent and an emphasis on developing new products based on the cutting edge of technology. During two-day planning sessions, each of Emerson’s 50 division presidents and their staff are grilled by Knight. Some view it as a contest of sheer stamina. But it has paid results. In 1976, 70 percent of the company’s product line ranked number one or two in share of market. In 1986, 83 percent had that distinction. During this period, net margin improved from 7.7 to 8.3 percent and its commitment to R&D spending increased from under 2 percent of sales to over 3 percent. Like everything else it does, Emerson’s acquisitions have been conducted without fanfare. Preferring private and closely held businesses that hold leading positions in their markets, the company avoids messy public auctions where the premium to book is higher. During Knight’s first 10 years Emerson spent $1.2 billion acquiring some 46 different companies. In the last year and a half it spent over $1 billion acquiring Copeland Corp., the largest maker of compressors; Hazeltine Corp., a New York-based leader in defense electronics; and Liebert Corp., a designer and manufacturer of computer support systems. In an era of the headline-grabbing write-downs, even Emerson restructures without hoopla. More than $150 million has been spent over the last 5 years eliminating products and redesigning others for world markets. As a result, the product mix has changed markedly. Ten years ago, industrial motors and drives were 19 percent of sales. Today they are 11 percent. Electronics were 2 percent of sales. Now they are 11 percent. Process controls have climbed from 8 to 17 percent of sales. The company has redesigned major product lines such as saws around world market requirements. Over the past decade, sales (representing 23 percent of total 1986 business), outside the U.S. have outpaced domestic sales. All this has been accomplished with hardly a blemish on the balance sheet. Total debt to capital is a pristine 17.7 percent. The company’s triple-A credit rating is enjoyed by few industrial firms today. Emerson’s bid for consistent high performance has not come without cost or criticism. Factory workers have objected strongly to demands for wage cuts, and even salaried executives have had to face slimmer paychecks. In addition to its emphasis on cost reduction and quality to become the “best cost” producer, Emerson is determined to become the key supplier to its OEM customers. To do this, it is working more closely with both suppliers and customers to share cost reductions and integrate design engineering. Steel-process finishing, that may have cost Inland Steel $22 per hour in labor costs, is now being done by Emerson, which can do the job at closer to $8 per hour in labor. The consolidation of sourcing among U.S. manufacturers is leading Emerson to offer component systems as opposed to selling individual components. Knight is the first to agree that he’s a demanding boss. When goals are set, he demands that they be met. Subordinates have reportedly been called for meetings at his home on Sunday following a meeting on Saturday. “His drive and perseverance are highly admirable,” says Sanford McDonnell, “but he works harder than he should. He doesn’t play enough for his own good.” In contrasting his management style with Knight’s, who sits on his board, Southwestern Bell’s Zane Barnes says, “I like to hire the very best people and then delegate up to the point where I’m about to lose control.” Some observers note that while his hands-on management style has produced stellar results it could, in time, suffocate promising subordinates. “What about succession?” says Sara Lee’s John Bryan. “That could be his Achilles’ heel.” The recent elevation of executive vice presidents Al Suter and Jim Hardymon to the newly created posts of vice chairman is evidence that Knight himself is at least aware of this concern. August Busch, who has recently joined the Emerson board, agrees that his friend is something of a taskmaster, but “more than that he’s a true leader. It’s a corny word today, but it describes him best. People wouldn’t do what they do for a guy who wasn’t as involved as Chuck.” However, demanding he may be as a chief executive, Knight clearly commands loyalty – average tenure of his executives is almost 15 years. Few companies can make such a claim. Twenty-nine years of consecutive earnings per share growth and 30 years of increased dividends per share are nothing to sneeze at these days. How do you continue to make it happen? The first thing any manager should do is understand what his job is, preferably expressed in one sentence. You would be surprised at how few people can do this. Some CEOs may talk about such things are civic duties – that’s fine, but that’s not my job. It’s something you spend maybe 10 percent of your time with. My job is to define and pursue the investment opportunities that will support our objectives, which are growing faster than GNP, maintaining high levels of return on equity (Target: 18 to 20 percent), and consistency of earnings. That’s my job. How do I do my job? In centers on one thing: management process. I hate to bore you but that’s the secret. Management process consists of six things. First, keep everything simple. This is the most difficult thing to do, in my experience. Managers get caught up in ideas and concepts that come out of business schools or consulting and look great on paper but just don’t work in practice. Matrix management. And what’s the latest one, this teamwork concept where people jointly make decisions? My point is that management is basically business-101. You develop plans and programs to achieve goals, follow up and pay for results. If you do that you’re doing damned well. But some people like to complicate matters. Second, commitment to planning is essential. Sixty percent of my time is spent in planning. I’ll spend anywhere from one to two full days just in planning for each of our divisions. Why? How else can I do my job of identifying investment opportunities except by head-to-head battle with the individual companies on where they want to put their dough? Third in our management process is how we follow up. The board meeting, the president’s council, division planning council, the corporate planning conference, the functional meeting, and the organizational meeting are all part of this. Most companies fail not in planning but in implementation. Why? My theory is that in order to keep young people, most companies feel they must keep promoting them, pay high salaries, and have lots of people reporting to them. Both are counterproductive in implementing company plans successfully because those who don’t stick with a project because they want to get promoted aren’t involved. The highest-paid staff person at Emerson doesn’t have anyone reporting to him. It’s important to get people to stick to a job and see it through. I’ll pay them and even reward them with stature, but they must be involved. Fourth in the process is an action-oriented organization. This isn’t just theory. It’s human nature, for example, for executives to group all the numbers together and see how big their pie is. The more dollars they are reporting, the higher the compensation. We don’t let anyone aggregate the numbers. We decide on the level where we plan and control profits and where decisions are made. This is one of my tests of institutionalization. How much staff do you have? Our staff is under 290 today (versus 296 in 1986) and we’re a big company. Staff creates work. The second test is, how do your people communicate? We don’t have a corporate organization chart at Emerson. Really. There’s no such piece of paper. The reason is I want people communicating around plans, projects and problems, not along an organization chart. Cant believe that a $5 billion company with 50 divisions doesn’t communicate along an organizational chain of command whether or not you’ve got a piece of paper with boxes and lines on it. Oh, there are chains of command, but you don’t need organization charts to have that. All organizational charts do is determine size of offices, who sits next to whom, and all kinds of nonsense. It takes away flexibility. We can take a group executive and let him run a small operating unit. Very few companies can do that. You see how little turnover we have. Fifth in importance in our management process is our best cost-producer strategy. The best cost is the lowest cost consistent with the highest attainable quality and performance. The sixth element is leadership. Can’t teach it. It must evolve from an organizational environment where people can make a difference. That’s the process. It’s a discipline. When people understand the process and are a part of it you can do anything. Other companies and other CEOs have a disciplined management process and several are larger than yours, so why don’t they have 30 years of uninterrupted dividend growth? There are managements who don’t believe that consistency is in the interest of the long-range value of their company stock. When you make that decision, and it’s legitimate, you’ll manage differently and take the ups and downs. Why do you place great value on consistency? Our peer review analysis demonstrates that the market tends to pay a premium for a consistent, high-performing company as compared to companies that are less consistent but are also high performers. At least the market has paid a premium over the last 12 to 15 years. Some argue that such a period of time is too short to build a case. When Harold Geneen ran ITT he was similarly concerned, some would say obsessed, with consistency. He still boasts of the 58 uninterrupted quarters of earnings growth. Geneen’s ITT was more diverse and had five time as many divisions as Emerson, but like him, don’t you have to postpone investment opportunities and make big trade-offs to achieve consistency? I don’t know what Geneen’s process was, and to me that makes a big difference. There’s no question that trade-offs exist. Certain investments, if not made, will hurt the company. But trade-offs go both ways. For example, in 1982, a tough year for Emerson and the economy, we put $15 million in a sensor laboratory. It was critical. We knew we couldn’t delay it two years because Honeywell, Yokogawa and Foxboro were all moving in that direction and we had to maintain leadership in sensor technology. Conversely, in our integral motor business we could put off redesigning for cost reduction or coming out with a new series of motors. Should we get out of the large, over 500-hp motor business? Easy decision to make. We delayed designing a new line for two years. The market wasn’t about to disappear. The management process here forces us to objectively separate the investments that are critical to survival versus those that represent incremental opportunities. You still appear to be sacrificing long-term shareholders wealth in order to keep smooth earnings. You assume that all investments would work under the same context. Sometimes by putting off an investment, assuming the technology and market do not change, we can make it in a different way at a later date and create more wealth for shareholders. I don’t say we don’t make mistakes. You can’t avoid it. For example, if I had waited another year I wouldn’t have made the investment in smoke detectors and saved shareholders $5 million or $6 million. In order to protect consistency, I’m sure we may have made decisions that have cost us a little in the long run, but there hasn’t been anything that materially injured a company or made it less competitive. Your acquisitions tend to be private or closely held companies where you don’t get involved in messy bidding wars. If your policy is to acquire sound companies with good management on a friendly basis, where is the added value for becoming part of Emerson? We try to bring a number of advantages, not the least of which is out management process and our product-cost discipline to get better and faster returns than would otherwise be possible. If we can do these two things and achieve a higher growth rate than our core businesses we can boost profitability and drive up value to above-average levels from Emerson shareholders. I never ruled out underachievers among the good companies we acquire and there are some good ones there that can do better with our help. If you have faith in your “management process” whey aren’t you buying turnaround situations? We’ve tried a couple. Our experience has shown that they take a lot longer than you initially think. Companies are often in such situations for reasons you don’t understand until you get into them, no matter how much preliminary work you do. Further, the dilution of management’s time and energy from the positive side of your business is often so great that you risk trouble. There are guys at Emerson who feel just as your question suggests, that we could create value by doing LBOs. We’ve got the money; let’s leverage the hell out of a few of these companies. We’ve reached a deliberate decision not to do this because it would call for a change in the management process that has worked so well for us. Let’s take Copeland, for which Emerson paid a half billion dollars last year. Where’s the value added? Copeland fits Emerson like no other acquisition ever fitted us. It has a real opportunity to increase profit margins. Their foreign operations, a $250 million business, were break-even last year, but could be as profitable as its domestic business. Second, it has a new technology for compressors called a scroll, which when integrated with what we have in motors, connectors, controls and valves, puts us in the position to work closely with all the big customers in the air-conditioning market. We think we can achieve systems efficiencies with Copeland that are considerably greater than the component efficiencies. All of the components are run as separate businesses, but when a Carrier or a Whirlpool buys multiple components, it’s to their advantage to deal with the best cost producer in each case. Our customers are in a very competitive market. If they win, we win. How do we do that? If it means selling five different components in a special deal, fine. If it means selling only one, that’s fine too. That may be a good approach strategically, but what do u do about the immediate problem where a Taiwanese compressor maker or a Brazilian motor maker knocks on Whirlpool’s door offering components at 20 percent below yours? There’s nobody doing that today. No more. Three years ago that was the case. We’ve responded to that by designing quality in the process of making the component to get costs down. People used to say that being the low-cost producer implies that we’ve cheapened our products. That isn’t the case here. We’re getting to the point where defects are counted in parts per million, and I’m not just talking about electronic products. We’ve reached a point where we just don’t ship a bad motor. A chief executive who knows you well says you’re particularly masterful in dealing with the globalization of markets. Where have you put this best-cost strategy to work internationally? The simplest example and most familiar would be our consumer saw, manufactured by Skil. For years the only competition had been Black & Decker. Suddenly, Makita, Hitachi, Bosch, among others, and all good companies, were coming into the U.S. market with good products. It forced us to rethink the entire tool line and to identify those products in which we had market share and scale to become world class competitive. As a result we came up with a circular saw manufactured in a highly automated facility in Hebrew Springs, Arkansas; it’s the lowest-cost saw in the world as well as the highest performer. It’s used by carpenters and professionals as well as home owners. We’re now the largest manufacturer of circular saws in the world. One thing we’ve learned in competing in global markets, and this relates to my earlier comments about our management process, is that there’s no point in making investment decisions based on cost comparisons to oneself. There is much talk about knowing your competitors’ costs. How much time do you think it took us to really understand the cost of a saw made in Germany or in Japan? It was enormous. Our process involves forcing people to spend the time and energy to get these facts. Mistakes are made when you don’t have all the facts. What is the biggest challenge facing the company over the next 10 years? Well, we’re going to be living in an environment of excess capacities everywhere, with a few exceptions, which means growth will be tougher to get. When you face growth problems and no margin with world volume, you’ve got trouble. It’s a bad combination. That’s why we’ve been spending these recent years to get our own house in order. That’s why we place much emphasis on protecting the company’s profitability. With the exception of our major acquisition purchase which is purely the accounting and fixed costs that go with them, we’ve got margins right up at all-time high levels. In March of last year we took 5 percent out of SG & A – $65 million. We cut our salaries even though there was no recession. Everybody understands that cutting salaries is something we don’t like to do. This implies an aggressive attempt to take market share away from your competitors. What’s the plan? The plan is to have the best product at the best cost and be in a financial position to help our customers win. There’s a consolidation of sourcing going on in this country, where all of us, Emerson included, are being forced to look at suppliers and align ourselves with them so when you need to do something vital, you can go back to them and get their commitment to support you. Also, when our customers need to do something, they know they can come to us and say, we need your help. This is a major change, particularly at Emerson, but in terms of future financial performance it’s necessary. We’re even integrating our computer systems with customers and suppliers. Emerson isn’t unique in that. Everyone is doing that these days. Well, not everyone. The important change is the change in thinking. It’s not every day you can find suppliers willingly, once the situation is explained, to give up something for both sides to protect market share as well as future growth. Your predecessor, Wallace “Buck” Persons, who had built a high degree of earnings consistency into Emerson before you took over, was your mentor. In what way did he influence you as chief executive today? It sounds corny but part of what drives me is the fact that he placed so much confidence in me and I just didn’t want to let him down. He permitted me to come to Emerson and rethink and change things while he was chairman. I’ll always admire his ability to deal with that because he built this company and I was the new guy. He put me on a couple of boards five or six years before I got here. So I became exposed early to the business and worked with him on organizational changes. I don’t think he was training me, just using resources at his disposal. Was Persons taking a big risk in recommending you, an extreme youth at the time, and a consultant, no less, to be his successor? An old-line manufacturing company might be inclined to prefer an operations guy from within. Have you ever had to meet a payroll? It was the first thing my old man taught me when I bought his consulting business. We had a good company, but once you have to meet a payroll it changes every decision you ever make in your life. My father did a lot of things for me, and one of them was to train the hell out of me. I did things at an age that most young men don’t have to do. I’m lucky to have survived the process because you are never sure how you are going to come out. I don’t think my being a consultant had much to do with my selection. It came down to the fundamentals of what it takes to run the business and whether or not you have the capacity to work with people to get the job done. Fortunately, I knew the people at Emerson well and had spent 18 months working with them. Did you ever have doubts? I had doubts. You’re not human if you don’t. But there was no doubt in my mind that I was going to give it my best shot. Do you see yourself as a tough manager? My definition of tough is probably different from yours. To me tough means that people want to be measured, have their performance talked about, and want to be compared to tough targets. Some people think tough is someone who is mean, cruel and unfair. That’s not it at all. I set tough targets and am demanding, so yes, in that sense I am tough; but I am fair. Name one challenge you would personally like to meet as Emerson’s CEO over the next 10 years. I would like Emerson to have the same relative performance over the next 10 year as we have had over the last 10. This doesn’t mean the same performance, because we’re going to be dealing with a different environment. But if we can duplicate what we’ve been able to do so far it will be very satisfying to me.